I am getting older; a significant milestone just snuck up on me. Out of the blue, I just realized it has been 25 years since I wore the Blue Beret, providing engineer support to the first troops to deploy with the United Nations Protection Force in the Former Yugoslavia. It seems surreal that the anniversary has sprung upon us so quickly and so silently. But given the 100th Anniversary of the Battle of Vimy, it is fully understandable. What we did pales in comparison to the deeds of those who fought in the Great War. Operation Harmony, which started at the end of March 1992, was the United Nations’ response to the civil war that had torn the Former Republic of Yugoslavia apart. First Slovenia broke away; then Croatia. This schism was the start of the falling dominoes; the breakup of countries behind the Iron Curtain continued over the next two decades. The fall of the Berlin Wall and Germany’s eventual reunification led Ottawa to believe that Canada’s Army Brigade in Germany was better used to foster world peace than to stand on unnecessary watch for the Russian Horde. This decision led to a commitment that was to last for decades. When the word came out that the Van Doos and the Combat Engineers would deploy, I was a 28-year-old captain, the second-in-command of 41 Field Engineer Squadron. Even though the Army trained me well, I was naïve and unworldly; I understood tactics, but only in the world of training exercises, field deployments, and simulations. This deployment was not training – it was the real deal. Ironically, given the pace of overseas operations that happened after, we thought that chances like this do not come often in an Army where a tour in Cyprus was rare and hunted. Even though my ex-wife and I were expecting our first child in 8 months and I would miss most of the pregnancy, I was raring to go! But the preparation is not what creates the memories. 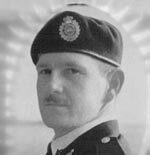 Most importantly, I remember that Sergeant Cornelius Michael Ralph, CD attached to the 4 Combat Engineer Regiment from 22 Field Squadron, Gagetown, New Brunswick, died when his vehicle struck a landmine on August 17, 1992 – tragically, the first casualty of many in that theatre of operations. I remember my bewilderment and dismay at seeing how horrible humankind can be. We were emotionally battered by signs of how merciless, how cruel, and how callous one human being can be to another. The barren, scorched earth harboured the sights and smells of untold horrors inflicted on the innocent, and perhaps, the not –so-innocent. I remember the utter destruction of the town of Vukovar, which suffered the most vicious fighting of the war. Mindless destruction and ruination caused by vengeful actions and spite filled the town. Factory chimney stacks with strategically placed tank rounds and destroyed bridges, defiled places of worship, ruined houses, businesses, hospitals, schools – all raped by high calibre weaponry and shells. It was an old-time Hollywood war movie set – except it was real. I remember the sites of mass graves – rows and rows of temporary markers: Christian crosses or Muslim crescents on the markers. I remember memorials near wells and in relatively open fields kilometers from villages; these spaces having witnessed acts that were unfathomable to young, trusting Canadians. I remember sad looking people trying to scrape together a meagre existence. To them we were a glimmer of hope. And I remember my first, first-hand experience of coming face to face with men who had fought and were still fighting with real bullets – dispensing and experiencing death with their own hands. Their cold eyes, their swagger, cockiness and disregard for life were scary. Their open disdain was a result of combat experience, and they took every opportunity to prove their machismo – every meeting punctuated by shot after shot of caustic plum Slivovitz brandy washed down with tetra packs of orange juice or a can of Orange Fanta. To refuse the glass of liquid fuel was an insult to their pride and created an imbalance they were always willing to exploit. They treated us as interlopers – and questioned our capacity to use force to stop them. I also remember the thrill and confusion of dealing with different nations – Belgians, Danes, Egyptians, Fins, Kenyans, Dutch, Nigerians, Norwegians, Swedes, Russians, – a mosaic knitted together in a common purpose but with differing capabilities and differing objectives. Strange ethos and ethics – some good, some not so good – was part of my education that some parts of the world were very different than where I was from. Communicating was a constant game of charades or Pictionary dotted with a dash of pidgin English. Sharing our garrison with a company of Russian Airborne months after the fall of the wall was bizarre. Our former enemy, the Russian Bear, shared the same barrack block, ate in the same mess, used the same fuel. This new union contradicted every instinct driven into the Canadian solder since the start of the Cold War. And I remember, oh so vividly, the scene of Russian officers beating young Airborne soldiers to a pulp for minor transgressions. Leadership through fear was a new concept for me – but as we learned, it was a common tactic amongst those with whom we now soldiered. I remember applying first aid as a young Yugoslavian conscript blew his hand off playing with munitions he did not understand. I remember his youth, and his anguish. I still feel guilty as I remember my relief that it was him, and not one of our soldiers. But tossed in between the challenges and obstacles, I remember good things too. I remember Vukovar Vern’s Bombed Out Basement Beer Emporium. A bit of Canada carved out of the basement of a Yugoslavian National Army Barracks Block, a place where I suspect several interrogations that crossed the bounds of human decency took place before the United Nations showed up. In this dark basement mess, we drowned our bad memories with unripe local beer; it was a time when alcohol on operations was an uncontrolled commodity. I remember the Vukovar Wrestling Federation, our weekly pantomime to exorcise the discomfort of being in an unhappy place. spend an evening in their portable sea container sauna, drinking aquavit during the Summer Solstice. Pressed sweaty thigh to sweaty thigh with completely naked Scandinavian military observers, being flogged with fresh vihta (silver birch branches) flown in from Finland was something I had never experienced before. And if I am lucky, I will never experience again. I remember how one calm evening, we abruptly stood-to and prepared for an attack, and how our immediate action and apprehension turned to disbelief, relief, and laughter when the abundant machine gun and automatic fire outside our camp turned out to be the local population celebrating the Yugoslavian Basketball Champions. But more than the good times or the hard times or the loss of a fellow Sapper, I will always remember the hatred and fear that was now Croatia and Serbia. It was not hatred of the Blue Helmets. It was the sheer evil of indiscriminate hate of wanting a person dead because of their ancestry, their religion, their race, or their name. I will remember the livestock slaughtered for no other reason than someone thought that it belonged to “them” – those who had no reason to exist in their country. I will remember the graffiti of death squads painted onto scorched houses. I will remember some of the vacant looks that I saw on people, only disappearing when replaced by the look of fear when they saw soldiers. And I will remember how I will always appreciate my circumstances in life; how lucky I am to live in a country where regional differences exist, but are not handled through unbridled violence or genocidal acts or war crimes. As Canadians we are gifted with one of the best places to live and to love. My tour twenty-five years ago reminds me of that forever. To those that I served with, I hope you realize it has been 25 years since we served together in Yugoslavia. I hope you raise a glass to our shared experience. And I hope you suffer no demons from the tour – some things just never go away.